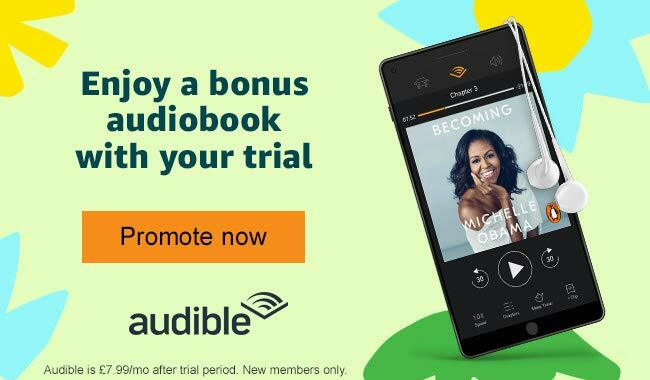 Audible Spring Sale: Get a bonus audiobook with your free trial! All new customers will receive two audiobooks instead of one in their first trial month - Prime customers can take a 90-day free trial, and non-Prime customers can take a 30-day trial. This promotional offer is valid for new subscribers from 10:00 08 April until 10:00 29 April, 2019. You will earn a £5.00 bounty for every eligible Audible sign up. You are eligible to earn £5.00 for every Audible free trial you generate. An Audible trial offers a great way for a new customer to try audiobooks. Prime customers receive a 90-day free trial, with one credit per month - ends 31 May 2019. Non-Prime customers receive a 30-day free trial. One free audiobook of their choice - theirs to keep, even if they cancel. The ability to choose from the world's largest selection of audiobooks including best sellers, new releases, sci-fi, romances, mysteries, classics, and more. After 30 days, they will receive 1 book each month for just £7.99/month (renews automatically). £5.00 earned when an eligible customer takes a trial. £8.00 earned when an eligible customer takes a full price £7.99/month membership, or a discounted membership (during selected promotional periods only). Download and listen to the world’s best storytelling. Enjoy audiobooks, original series and more on the free app. Heighten your everyday moments - whether you’re driving, commuting or just unwinding, transform the moments when your hands are busy but your mind is free. Listen to your favourite genres including best sellers, latest releases, sci-fi, fantasy and more. Can I earn a bounty for sign-ups I refer through the Audible.co.uk website? No. You can only earn bounties for Audible products and services that are sold on Amazon.co.uk. Does a visitor need to complete the Audible Free Trial before I get paid? No. You will be paid a bounty for all eligible Audible Free Trials initiated regardless of whether the visitor completes 1-, 17- or 30-days of their Audible Free Trial. How can I track how many Audible sign-ups and purchases I have referred? You can view your earnings for eligible Audible purchased by logging into Associates Central and viewing the Earnings Report. Bounty earnings will be listed under Miscellaneous Referrals Summary. Be sure to check “combined reports” when accessing. Is everyone eligible for an Audible trial? A customer may take a trial as long as they have not taken a free trial within the last 12 months on the associated account or credit card. What constitutes a valid purchase? An Audible trial must be entered with a valid credit card. Any purchase must not be declined.